I host a bbpress forum for each of my wordpress plugins, so that people can report bugs and ask for new features. Bbpress has many of the same features as wordpress, and it integrates very well with wordpress. It is also very fast, and as of version 1.0, now has the same admin interface as wordpress. 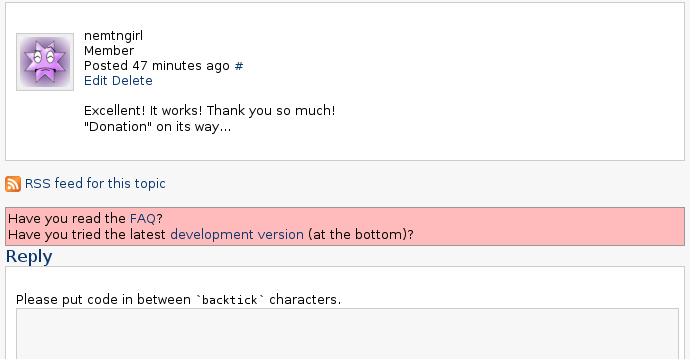 When people report bugs on the forum, I frequently try to fix them in the development version of the plugin, and ask them to test it, which requires downloading the development version from the wordpress.org site. Unfortunately, the development version is a bit hidden there, and I have gotten very tired of typing out the url in my replies, so I finally modified the topic.php file in my bbpress template to include a link to the development version (and a link to the faq too). Have you tried the latest <a href='<?php echo $development; ?>'>development version</a> (at the bottom)? This entry was posted in php, wordpress and tagged bbpress. Bookmark the permalink. Low Cost – Online Payday Loans! “One of the cheapest online pay day loans… this site has enabled me to pay debts and remain financial stress free” – Allan T.
ENTER HERE TO GET [url=http://www.onlinepaydaytoday.net]NO CREDIT CHECK LOAN[/url] TODAY!